Minor side edge crack and scuffing on back of slab. Cover pencils by Rich Buckler, inks by Frank Giacoia. "Of Magic and Madness! 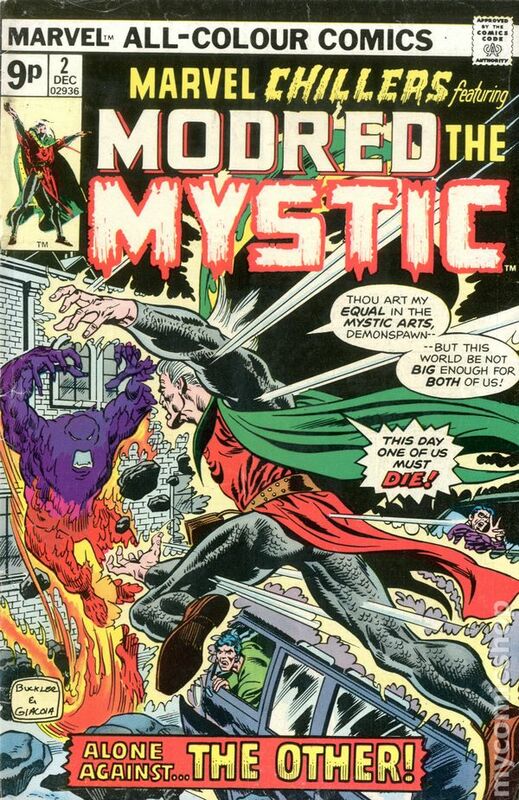 ", script by Bill Mantlo, art by John Byrne (page 1) and Sonny Trinidad; Mordred witnesses the progress that 1100 years has done to London; Not understanding what he sees, he lashes out with his mystical might, bringing the police; After he's hit by a bullet, Mordred is grabbed by Janet Lyton and Grant Whittacker, and they escape in a van; After Janet and Grant treat Mordred's wound, they are all stopped when a bright sphere of energy appears in the middle of the road; It is the Other, the creature that powered the book of Darkhold; The mystical being has come to collect Mordred's soul, but Mordred put ups a fight. 36 pgs., full color. $0.25. Cover price $0.25. Distributed in the United Kingdom (England). Exact copy of American edition except for cover price ("9p"). Cover pencils by Rich Buckler, inks by Frank Giacoia. "Of Magic and Madness! 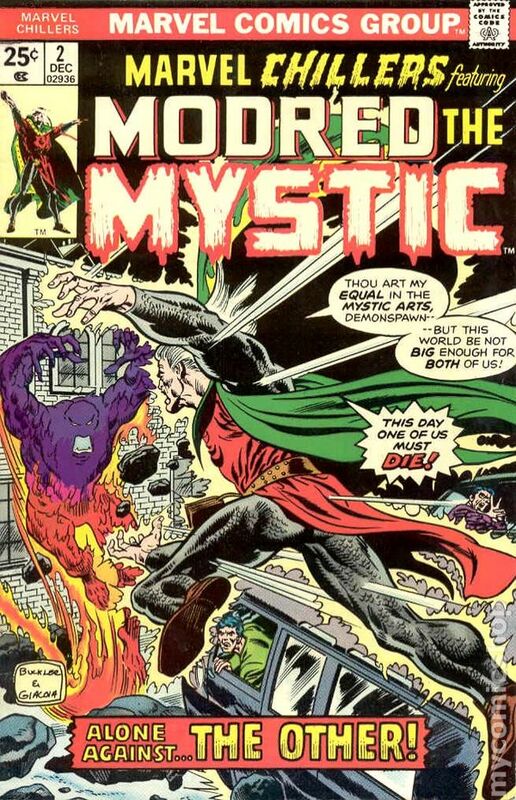 ", script by Bill Mantlo, art by John Byrne (page 1) and Sonny Trinidad; Mordred witnesses the progress that 1100 years has done to London; Not understanding what he sees, he lashes out with his mystical might, bringing the police; After he's hit by a bullet, Mordred is grabbed by Janet Lyton and Grant Whittacker, and they escape in a van; After Janet and Grant treat Mordred's wound, they are all stopped when a bright sphere of energy appears in the middle of the road; It is the Other, the creature that powered the book of Darkhold; The mystical being has come to collect Mordred's soul, but Mordred put ups a fight. 36 pgs., full color.